Spring is upon us. This season comes with several gift-giving occasions. Weddings, graduations, Mothers Day, new born babies, holidays, etc. 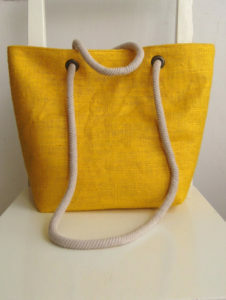 There are many others opportunities for creativity and showing your love with something handmade like a bag. Knitting and crocheting for spring involves lightweight yarns, airy stitches, as well as, lovely colors. Brights and rich neutrals definitely have their place in this gradually warming weather. Bags and Accessories, which are made of environmentally friendly products like jute, cotton, canvas & juco, makes excellent spring gifts. Spring usually means the perfect reason to use a nice tote bag. Whether you go to farmers markets, yard sales, or just wanting to walk to and from the store- it simply means everyone needs something durable, as well as, cute to carry their purchases. Cute, as well as, versatile accessories are very important to have. In this in-between weather, it can certainly go from hot to cold or vice versa just at the drop of a hat. So gifts like shawls or lightweight hats are extremely useful. Decor and Blankets are the gift of Spring is this wedding season. A nice gift for the happy couple’s home is always welcome in this case. Instead of something expected & usual, try making something personal that they’ll treasure for years to come. Blankets & decors are also great gifts for graduations, housewarmings, new babies, etc. After all, it is highly likely that a handmade item would be highly appreciated.